What is Your Connection to the Food You Eat? 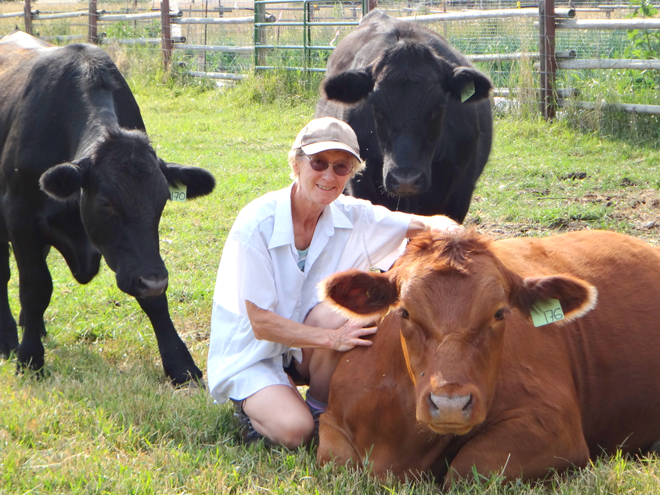 I am a local producer of organically grown produce and grass-fed beef. Sometimes folks comment about the price of locally produced produce and meat, labelling it ‘so expensive’. To me this begs the other side of that comment: ‘why is conventional produce and meat so cheap?’ I think we all know that goods are cheaper when they are massed produced and especially if using foreign labour. Mass production of food includes monocultures (grains, corn, and other field crops); factory farms (poultry, swine, dairy); feedlots (beef cattle); and fish farms. So, when a consumer is in the grocery store and choosing a package of meat what are they considering? Price would be one factor. What about where the animal was raised? What it was fed? Was it in its natural animal friendly environment, or was it raised in confinement? Was it from a factory farm or feedlot? How was the animal slaughtered? Where was it kept prior to being slaughtered? Will their food dollar stay in the community? Does their food dollar contribute to food security in their community? When a package of meat says, ‘no antibiotics’ this imparts one piece of information about what the animal was not fed. However, it does not give information on the whole picture of how the animal was fed and raised. Even though the animal was not fed antibiotics, were there GMOs in the feed? Was the feed organic? Was the animal in a confined, indoor housing arrangement, or were they outside? Is your food dollar paying a local producer, or a producer outside of the province? Conversely, a consumer can purchase from the producer directly or from a local market such as Cariboo Growers in Williams Lake. The above questions can be answered. For a conscientious consumer these answers should be important. Knowing the animal had a good, naturally fed, well-cared for life and a respectful slaughtering should impart a good spiritual connection to the healthier food that is consumed. Knowing that their food dollar goes to local producers and therefore stays in the community should impart a good emotional feeling of connection to the community. The same would pertain to plant goods. Were the plants grown in depleted soil, bolstered only by chemical fertilizers? Or were they grown in soil nourished by compost and cover crops, and on a rotational basis? Was there a reliance on herbicides to control weeds and insecticides and fungicides to control pests and diseases? Or were there organic controls used for weeds, pests, and diseases? How far did the ’fresh’ produce travel to reach you? How old is it? What do you think is healthier to consume for your mind and body? Nowadays there seems to be a disconnect between reality and how people perceive their food. Ads for food seem to dominate TV, radio, magazines, and newspapers. Flavour and price drive these ads. Animal welfare is hardly mentioned. When folks are raving about a meal do they consider the way in which the food was produced? Do they give thanks to the animal whose life was taken so that they could be fed? Do they give thanks to the farmer who protects and nourishes the land they use? Do they give thanks that local producers hire local folks and contribute to the community both monetarily and by providing food security? Or are they just happy to have a cheap tasty meal? Is consuming locally, healthier produced animal and plant products not worth more money to you? An interesting website to visit is https://www.westonaprice.org. A large range of topics is covered including traditional diets and farming practices from around the world, confined animal feeding operations (CAFOs), genetically modified organisms (GMOs), the science behind chronic illnesses and the typical North American diet and much, much more. In the next issue of TheGreenGazette, LeRae Haynes will be covering the topic of animal welfare at the time of slaughter. 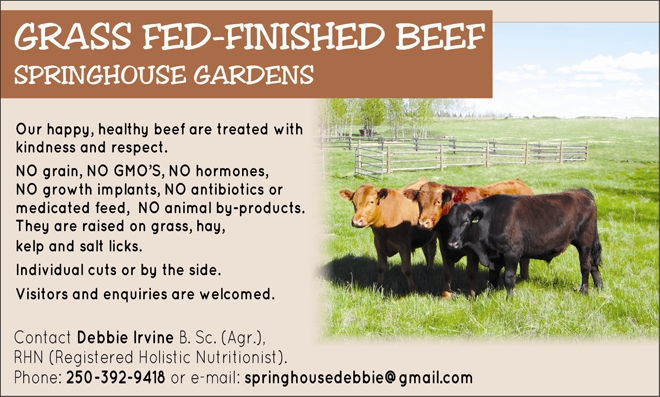 Debbie Irvine raises her grass-fed beef and market garden in the Springhouse area of Williams Lake.